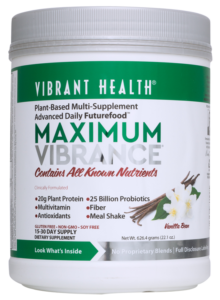 Superfood supplement manufacturer Vibrant Health is proud to announce their product Maximum Vibrance has won a sought-after 2018 Delicious Living Supplement Award. Maximum Vibrance combines Vibrant Health’s flagship green superfood complex, Green Vibrance, with antioxidant blend, Spectrum Vibrance, plant based protein, and organic vitamins and minerals. Maximum Vibrance is the most comprehensive, nutritional multi-supplement you will find on store shelves today. It comes closer than any other dietary supplement to being the one product you could take in place of all other supplements. Once technology allows for a shelf-stable, powdered option for essential fatty acids, Maximum Vibrance will cover all nutritional needs. Maximum Vibrance contains over 100 ingredients, each with a specific purpose. Each serving provides over 20 grams of clean, balanced, plant-based protein and amino acids in ratios that support all human needs. The fruits and vegetables were selected based on solid nutritional content—only the most nutrient dense were selected for consideration. Maximum Vibrance, like Green Vibrance, contains 25 billion probiotics per serving, offering a formula strong in lactobacilli (small intestine) and bifido (colon) bacteria, reinforcing immunity and improving nutrient absorption. In addition to ingredients which take into consideration necessities for general health (such as liver and circulation support), Maximum Vibrance brings the supplemental dosage of important vitamins and minerals up to levels found in many tableted supplements by including new, certified organic supplements derived entirely from plants.